Hermia, Helena, Lysander, and Demetrius - what a crazy group of kids. Is there anything that needs to be said about the plot of this show? Two couples head into the woods, fairy King and Queen of the woods are fighting, a group of actors head into the woods to rehearse and shenanigans ensue. We all know the story. This is one of the last shows that Joe Dowling is directing at the Guthrie. I have been told that it is a remounting/reworking of a previous Dowling production. I never saw the original so I can't vouch for it. 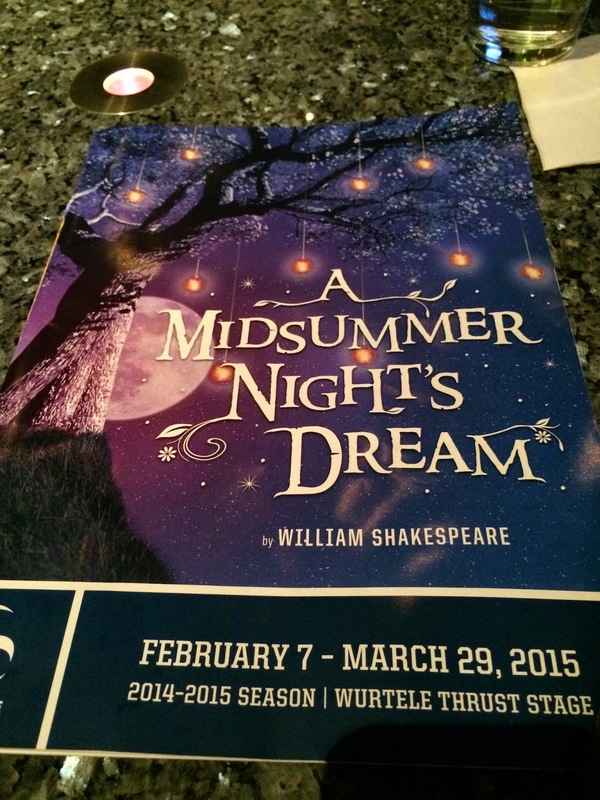 What I do know is that I really enjoyed watching this production. It was fantastic! Blank stage, directed in the round (to some extent), actors flying in....it was a great joy to watch. I have to admit that I thought the pacing was slow at the start but that only lasted for the first few minutes. Then again, it may have just been the start of the show. All the excitement starts when the Fairies start coming in. What I found really enjoyable was the costuming and make-up of the Fairies. It is done in a punk style and some of the text is sung in a 50's doo-wop style, mixed with jazz and blue. Such a great choice. The pace of the show was good, and consistent. I was interested through out even though I have seen the show many times. I have to admit one more thing. I am not a fan of the Mechanicals...as a rule. This production helped change my mind about them. They were full, well rounded characters and their final performance...well... I was laughing so hard I was crying. Then they changed on a dime and almost brought me to tears for real. It is a really good production, an amazing cast (including the much written about Tyler Michaels as Puck) and well worth the three hours. In fact, it certainly did not feel like it was that long. Go see it...it closes soon. Yes, I realize that Pippin played a short run over a month ago. Yet...I did want to do a short post about it. First off, I love this show. There is some really good music in it, it tells an interesting story in a very interesting way...and it is a fun thing to watch. The original production (with some small changes) is readily available to view. It has the incredible Ben Vereen as the leading player, as well as William Katt. This production is a revival that played Broadway and incorporated more circus, and acrobatic aspects to it than the original. It features a female leading player which made no changes at all. By that I mean that the gender of the leading player does not make a difference to the score or the show. Here are just a few impressions I had of the touring production. The audience was really varied and ranged in ages. It was great to see. The staging was very symmetrical, which was nice. It kept the focus where it should be - on the main characters. The great thing about this was the use of magic and acrobatics - including aerial work - that was exciting to watch, and yet also brought interesting aspects to the characters. There was great integration of dance and the circus elements, each feeding the other. I would have to say that the best thing about this production was the lead-in to the songs. There was great underscoring and the songs just came up naturally. It was so well done. Finally, if you have seen the original production via DVD - the ending has been slightly revised. It is good. Two things specifically about this tour: The actor playing Charles was John Rubinstein...who just happened to originate the role of Pippin in the original production. He still has the skill and the stage presence and was really great! The other great thing about this tour is Priscilla Lopez playing Berthe. Yes, we all know Priscilla from In The Heights and even more from the original cast of A Chorus Line." Let me tell you that she looks amazing still, and does amazing work on a trapeze! Even to the point of singing upside down!! so awesome! 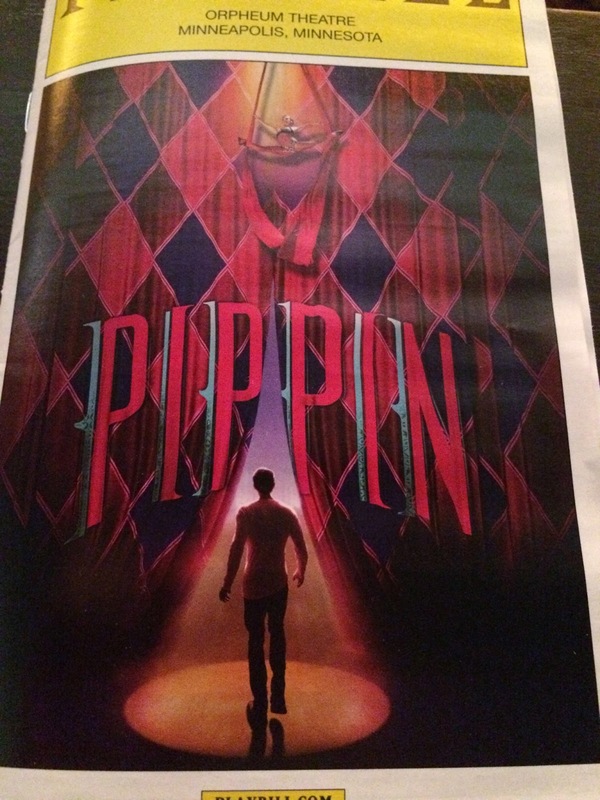 IF you have a chance to see a production of Pippin, I would take that chance for sure! Can I say? I lurve Pillsbury House Theatre. Every time I go to their space, I'm impressed by their amazing community vibe, services and outreach. Also, I LOVE that there's a speaker from backstage in the ladies' room. Someone needs to do an audio art installation there. "Within the confined space of a nursing home, the play raises large ethical questions. What is the power of money? How does it affect our lives and our relationship to our family? How does it affect the care we receive? What is the value we place on living? The play looks at these questions through myriad vantage points." Beautifully acted by a cast of four, and performed on a spare stage in Pillsbury House's intimate space, I was absolutely riveted by this play. I loved the naturalistic speech, and the very realistic ways we follow the thoughts and progression of character. I've seen Regina Marie Williams in a ton of theater (most recently in The Color Purple at Park Square Theater), but she utterly disappeared into her role at Tina, nurse to Wendy Lehr's dying patient. She was amazing to watch. Clarence Wethern, playing her boss and more, provides a complex but fascinating portrayal of a man in over his head. With impeccable timing, he adds immediate depth, complexity and welcome humor to the play. Wendy Lehr and Tracey Maloney create the complex relationship of mother and daughter with ease and edge. Second side note: How cool is it that Pillsbury House is doing workshops on Health Care Directives and Estate Planning in conjunction with Death Tax? So cool.